Why burro(w) into your data? We use burro as an introductory tool for EDA by using it in “data scavenger hunts”, where groups of students are given specific questions to answer about the data, and then have to show their fellow students the answer and how the discovered it. Looking at the data together is vital to building understanding of the data together. 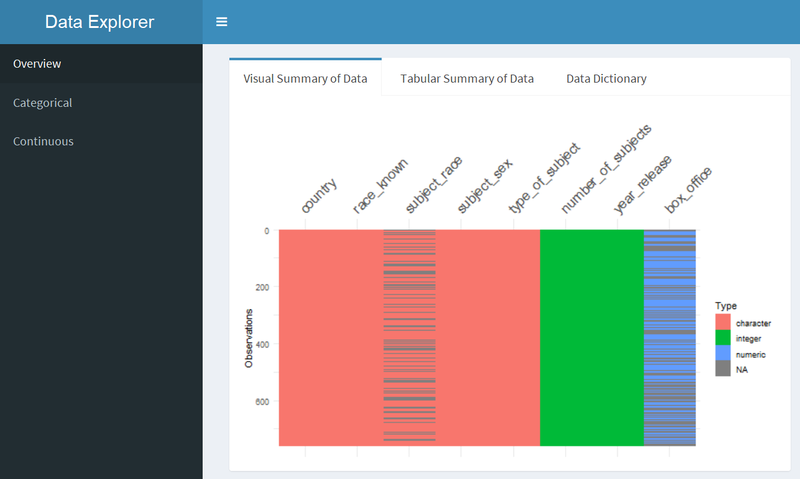 By concentrating on the data visualization first, burro apps let us have conversations about the data, and hopefully motivate students to learn more tools of EDA such as ggplot, visdat, and skimr. burro is currently only on github and not on CRAN yet. To install it, run the following. burro expects a dataset as a data.frame or data.table. The dataset should have at least 2 numeric variables and two categorical variables. burro requires an outcome variable, which should be categorical/factor. It’s on my list of things to do to make burro adaptive to the data passed into it, but it currently is pretty inflexible about these two things. An optional (though helpful) requirement is to have a data dictionary which has a column called variableNames that defines each variable in the dataset. Here we make a burro app using the explore_data option for the NHANES (National Health and Nutrition Examination Survey) data. We specify our covariates, and our outcome of interest (Depressed, the number of depressive episodes). We can examine the biopics dataset using burro. We specify our outcome_var to be subject_sex, so we can examine everything through the facet of gender. burro uses many wonderful packages developed by Nicholas Tierney and rOpenSci: visdat, naniar, and skimr. burro was partially developed with funding from Big Data to Knowledge (BD2K) and a National Library of Medicine T15 Training Grant supplement for the development of data science curricula. 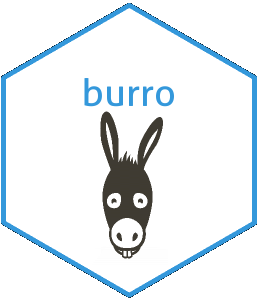 The burro hex sticker uses clipart designed by Freepik. The esquisse package (https://github.com/dreamRs/esquisse) is a wonderful start to making a drag and drop visualization tool in R. Check it out! burro is released under a MIT license.